Tim Cook has once again defended the iPad in the face of continued falling sales, arguing that the “underlying data” paints a more positive picture than the pure sales numbers, and predicting that there will be future iPad growth. First, he said, the partnership with IBM is still in its early stages, but is already showing great promise. First-time buyers also make up a high proportion of sales, suggesting future upgrades likely down the road, and intent-to-buy numbers are also great. The iPad also hit a new quarterly record for sales in China. Cook also made his usual comments about the iPad topping the tablet stakes in both customer satisfaction and usage. Cook said that Apple was continuing to invest in the iPad “product pipeline” as planned, and that while he wouldn’t predict when iPad sales will return to growth, he “strongly predicts” that they will. The reference to the future product pipeline almost certainly refers to the long-rumored 12-inch iPad Pro. Bloomberg reported last month that the larger tablet aimed at the education and professional markets had originally been targeting an April to June launch but has now been pushed back to September. There have been various rumors about how the iPad Pro might differ from existing models, suggestions including both an optional stylus and ports that would allow a keyboard and mouse to be connected. There was, however, some skepticism from analysts, noting that Cook made the same arguments last time around, and Bernstein’s Toni Sacconaghi observing that the consensus view is that Apple will ship more Watches than iPads in the next two quarters, despite very constrained supplies of the Apple Watch. Cook responded simply by saying that he was “thrilled” with response to the watch, and no more should be read into it than that. John Gruber did draw my attention to one final piece of good news for the iPad in Quartz‘s excellent set of slides – albeit one that may not last much longer. 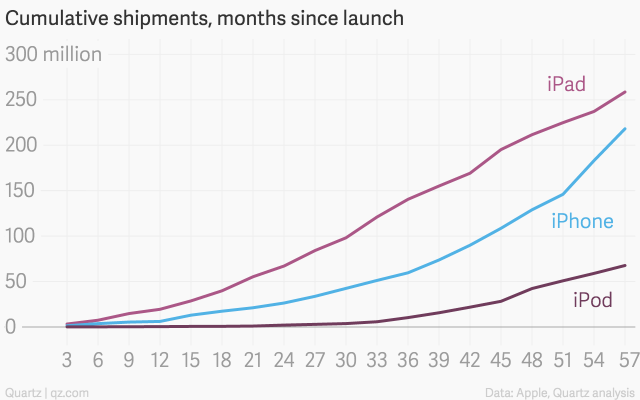 If you measure cumulative shipments by months since launch, the iPad is still, for now, doing better than the iPhone did.